HomeResourcesPerspectivesReturning Capital to Shareholders: What Are You Missing? Returning Capital to Shareholders: What Are You Missing? Business Leaders are constantly searching for growth opportunities that can take their companies to the next level. But so many companies appear unable to find attractive investment opportunities, as they are instead choosing to return capital through dividends and buy-backs. Yet, there is a systematic method to find growth opportunities worthy of investment. The right framework will take you on a journey to discover and select the optimal opportunity from the universe of potential options. Over this period, an increasing number of companies returned capital. 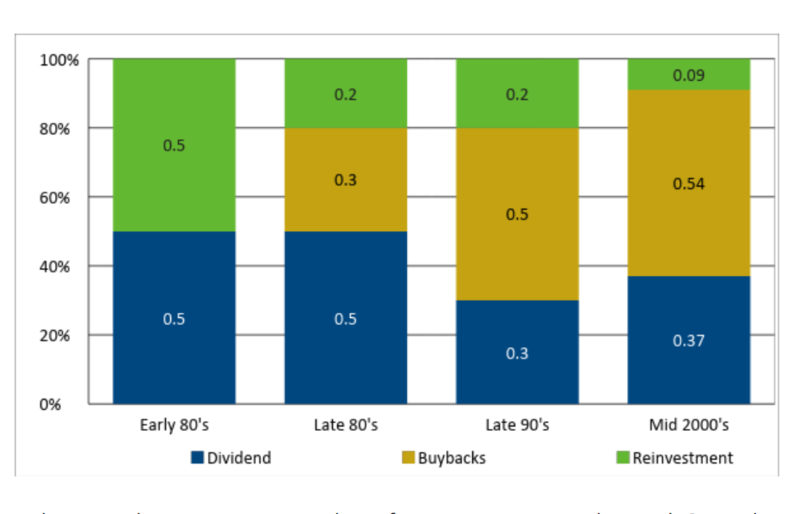 Since the early 90’s the percentage of S&P 500 companies allocating capital to dividends and buybacks—at the expense of growth opportunities—doubled from 42% to 85%. Doing so may offer the best investment opportunity in the near-term. But over the long term, only reinvestment through capital allocation in business opportunities leads to sustainable growth. Given the obvious benefits of allocating capital into growth opportunities, why do so many companies appear to face significant challenges in their attempts to find and select these opportunities? Simple: They lack a framework that systematically finds attractive growth opportunities and produces the conviction to pursue them. While these challenges are common, some business leaders have managed to overcome them. Instead of utilizing one of the traditional—but problematic—approaches, they apply frameworks that are flexible, customized, objective, robust, and comprehensive, to systematically evaluate opportunities. 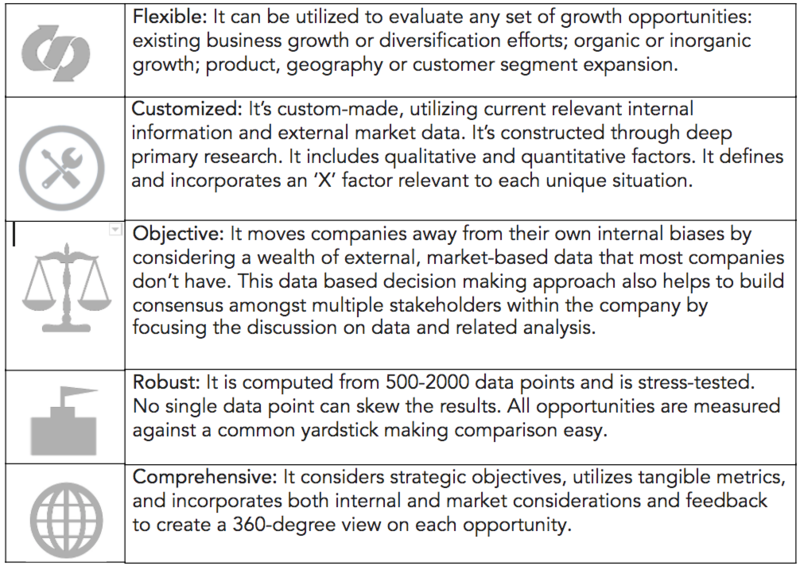 Within these frameworks, leading business leaders leverage data—including data that is often thought hard to come by—to identify and prioritize their best growth opportunities. Their frameworks systematically tell them where to allocate their capital to grow their companies. In the process, these frameworks also build internal consensus and produce a level of conviction in the selected growth opportunity that makes the benefits of investment obvious. One such framework is the Opportunity Prioritization Index (OPI). The OPI framework was designed for one simple mission: To help business leaders determine which growth opportunities most deserve their capital. To better understand how the OPI framework operates, consider how the following three Fortune 1000 companies recently deployed the OPI to find, evaluate, and select growth opportunities. Each company pursued a different strategic growth vector, and faced unique challenges to opportunity selection. Yet the OPI identified effective growth opportunities for each. The Company: A global leader in industrial equipment who had already created a presence in more than 120 countries. Their Challenge(s): The company held existing knowledge of the business potential of the countries they considered investing in, but their knowledge was skewed by the company’s current presence, and the perceptions of existing managers. To help objectively identify their next best opportunities, the company utilized a two-level OPI framework involving over 45 criteria and more than 900 data points (sourced from a mix of primary and secondary research). The deployment of OPI played a crucial role in their selection of which countries to invest in. The OPI’s data-driven approach—along with robust sensitivity analysis—was critical in building consensus in favor of the chosen countries. Outcome: Evaluated, scored, and ranked 120 countries. Identified and prioritized countries with the highest potential. Invested in 5 top ranked countries. The Company: An industrial products company with a global leading position. Their Challenge(s): First, the company had to define the client segments to measure. If too broad, they couldn’t identify promising niche—but sizeable—segments. If too narrow, they would have to sift through 400+ industry segments. Second, they had to identify attractive and actionable industry segments. The segments had to be available for acquisition, with technology differentiation potential. 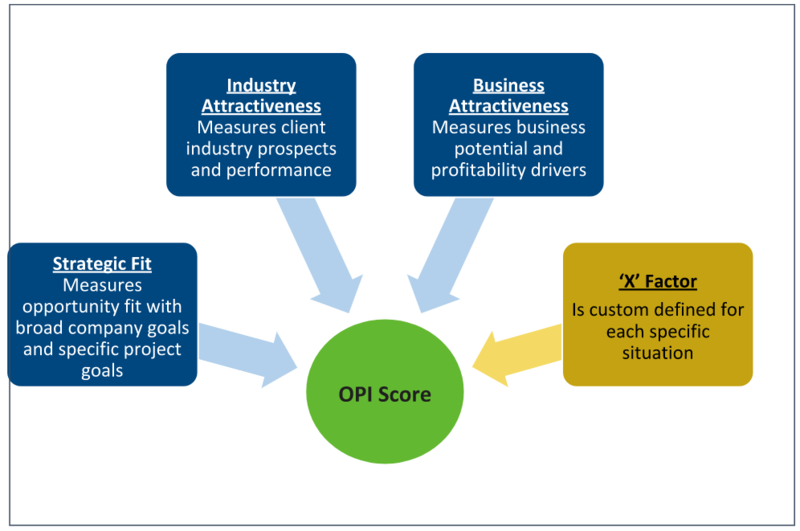 The OPI framework helped define, measure, and select the most attractive segments. This company used an OPI framework involving 13 criteria and over 500 data points (sourced through a mix of primary and secondary research). Outcome: Defined, evaluated, scored, and ranked more than 60 client industry segments. Identified and prioritized 3 segments with the highest potential. Formulated a corporate development program and initiated contact with target companies identified during this process in the 3 prioritized segments. The Company: A global healthcare company with market leading products that relied heavily on one ingredient. Their Challenge(s): First, the companies they considered acquiring were small, with little information available about their products’ efficacy. Second, product portfolio opportunities (built or bought) and geographic expansion opportunities required different evaluation criteria. To fairly evaluate all opportunities, this framework had to create consistent scores that could compare substantively different opportunities. This company utilized an OPI framework involving 15 criteria and 1,000+ data points (sourced through a mix of primary and secondary research). To produce a meaningful comparison, different weights were used for companies offering geographic expansion as opposed to companies offering product expansion. Outcome: Evaluated, scored, and ranked more than 130 companies. Identified and prioritized 24 companies to track and pursue for a transaction. Initiated discussions with several of the 24 companies identified. Each of these three companies sought different growth opportunities. Each company encountered different challenges during their pursuit. But they all faced this core common issue—how to find growth opportunities worthy of their capital allocation. 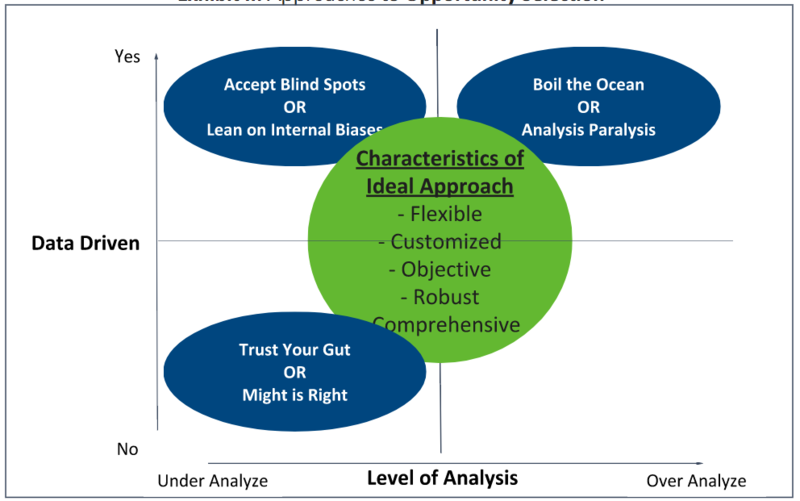 And they were all able to identify and prioritize their best growth opportunities by deploying the OPI framework. To some degree, all companies analyze and evaluate their opportunities by constructing and considering various factors and weights. Why did the OPI succeed in these opportunity selections when other evaluations did not? The OPI framework builds confidence in a company’s decision-making and capital allocation process. It provides a systematic process to select the growth opportunities most worthy of a company’s capital, and a tangible use of capital that drives future growth (rather than returning capital to the shareholders). 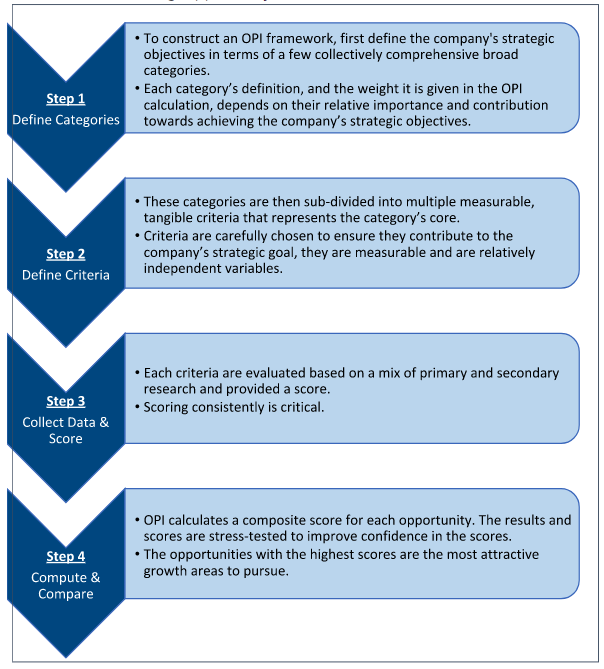 Computing an OPI score to evaluate, score, and prioritize growth opportunities requires a four-step process. This process takes each growth opportunity and primarily evaluates it according to four comprehensive categories. These four categories set the foundation for deeper evaluation and comparison through the full OPI process. How do you allocate capital? As a business leader, efficiently allocating capital towards growth opportunities is one of your most critical mandates. To fulfil your mandate for growth, you must separate the wheat from the chaff, and determine what growth opportunities deserve the allocation of your company’s capital. Do this well, and you ensure your lasting contribution to your company. Today, your mandate is harder to fill than ever. The modern business leader’s return of 91% of their earnings to buybacks and dividends attests to this fact. We have quickly progressed from a world of too little information, to a world of too much information. The skill required to identify and select your best opportunities also needs to be transformed. It is increasingly important to be able to produce actionable recommendations by utilizing a consistent framework, analyzing substantial amounts of ‘relevant’ information within a reasonable timeframe. The OPI does just that. In today’s hyper-connected world, there are so many growth opportunities laid out in front of you. Only a few of these opportunities offer true opportunity. Your challenge: how to systematically select opportunities that will help you fulfill your capital allocation mandate.